Just got outta stand when I saw 2 deer running towards me.As they ran by me I grunted and was given enough time to get a shot as they stopped broadside 25 yds. 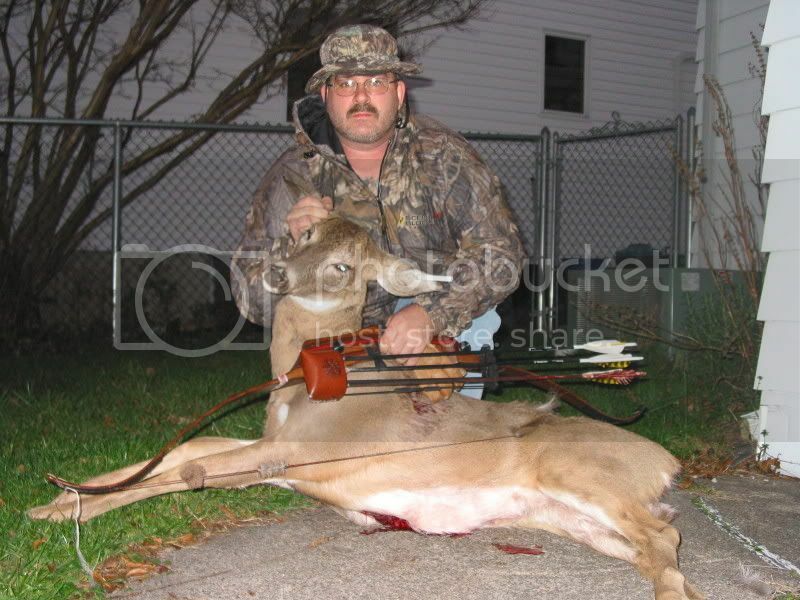 away.Arrow went in low on right and stuck out high on left,a double lunger.She ran 200 yds. but tracking was easy.By 10am I made my 2nd trad. harvest!! Congrats Peter, Thats Gonna Taste GOOD. Is that Widow? What are the specs? I can thank you guys and this site for my success this year.Pick up alot of info,and help. Ron, yes its a BW 60" MAIII 53#@29",I shoot a 31" CX300 w/a wghted 140 Magnus(150) 2 bld.So far this year its been the ticket to the freezer train.